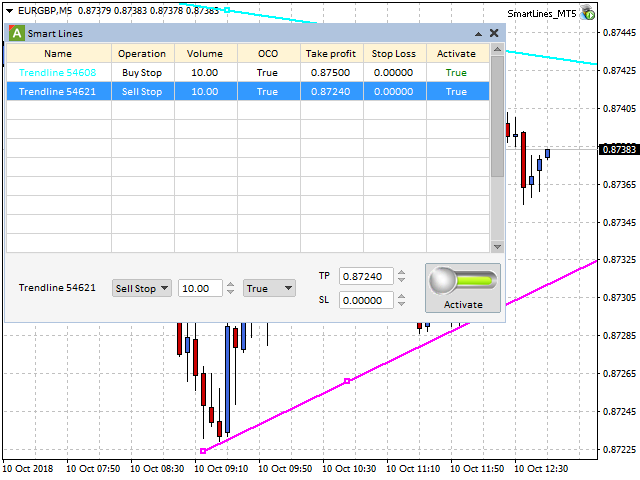 SmartLines allows you to open orders using trend lines. Now you have the opportunity to control breakthroughs of the trend corridor automatically and without delay. As soon as the price crosses your trend line with your settings, the order is automatically opened. You will not miss the moment of the trend change. The principle of working with SmartLines is similar to placement of pending orders. However, pending orders only have the horizontal direction, making it impossible to place them along the trend. 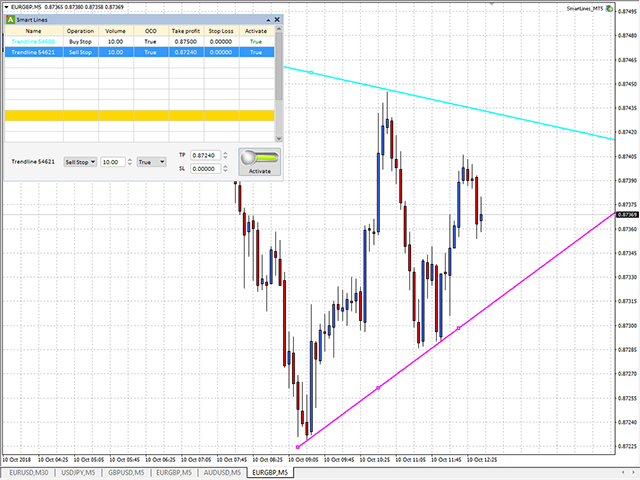 Using trend lines along with SmartLines, you will be able to place pending orders in either direction of the trend. Launch the SmartLines Expert Advisor, the program will automatically add the trend lines existing on the chart to the list. Operation – type of the trade operation. Volume – volume of the trade operation in lots. SL, TP - if necessary you can set Stop Loss, Take Profit. Press the Activate button. Once pressed, the trend line selected in the menu switches to True. This means that once the price reaches this line the order will be opened. Use the same button to deactivate. Install the EA from the MQL Market. In the menu Tools -> Options -> Expert Advisors, check the 'Allow automated trading' box. In the 'Common' tab of the EA settings, tick 'Allow live trading'.